Bruce and Brad have been playing together since Brad was a wee young thing of 12 years old. They both play fiddle and nyckelharpa. In August 2018, Bruce and Bruce released the CD Letter from America, which features tunes in Swedish styling but composed by American musicians. 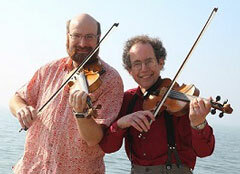 Bruce's latest collaboration, this Scandinavian fiddle duo performs original and traditional repertoire for dancing and listening. Most often you'll hear either twin fiddles or twin nyckelharpas, though you might also catch the occasional hardingfele solo. In March 2010 we released the CD Northlands, a project drawing together a collection of original tunes, inspired by our shared passion for Scandinavian fiddle traditions and composed in traditional styles. 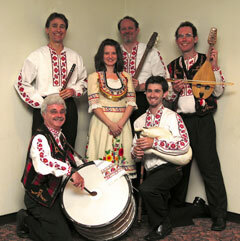 In the Bulgarian language Lyuti Chushki means "Hot Peppers," and that is the kind of spicy traditional Bulgarian music this band plays. Lyuti Chushki is a combination of professional musicians from Bulgaria and American musicians from the Baltimore/Washington area who have been playing together for festivals, weddings, concerts, and other special events since 1997. The toe-tapping music, played on traditional instruments from Bulgaria, takes you back to the old country -- it is joyful, evocative, compelling and lyrical, in modes and rhythms generally not found in western music. 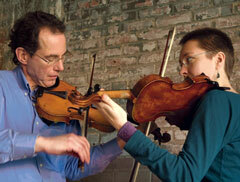 In this band Bruce plays gûdulka, which is a bowed stringed instrument with resonating strings. Other instruments in the band include kaval (end-blown flute), gaida (bagpipe), tambura (fretted instrument similar to a guitar), and tûpan (large drum). All of these serve to accompany the unique Bulgarian vocal style which has a beauty on its own. 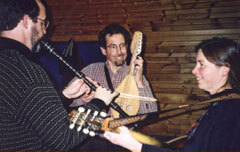 The Michigan-based trio Veselba consists of Bruce (gûdulka), Chris Rietz (kaval, tambura), and Nan Nelson (tambura, bass, vocals). We formed in 1998 to play music from Bulgaria on native instruments, but have since branched out into other musical traditions including those from Greece, Romania, and Scandinavia. "Veselba" means "merriment" in Bulgarian.